Well, it seems as though I managed to dodge Ophelia! Hope the rest of you were just as lucky (we're not used to big storms in the UK). My attention this evening turns to new London-based band Desert Smoker. Billed as a sludge/doom metal band, Desert Smoker seems to have only recently surfaced yet has released a six song full-length in very quick time indeed. Featuring main songwriter/musician Chazz Fenrir who provides vocals/guitar/bass on the album (no word on who or what provides the percussion), 'Void Of Smoke" appears at first glance to be an angry and disturbing body of work. “Void Of Smoke” begins with the Intro/title-track combo, which comes in the form of an instrumental. It’s solely made up of guitar/bass riffs and definitely leans toward sludge/doom. There’s a quiet melody that comes through from the bass, audible over the atonal guitar riffs and feedback. There’s low-slung groove on Bleeding Trees; however, that groove is shaken out of you by Chazz’s black metal-like shrieks. It sounds like Desert Smoker has employed a drum machine for percussion on the record, but it does the album no harm at all. One thing’s for sure, there’s more than a whiff of depressive/suicidal black metal influence on here. This album is very much presented in a DIY light and it’s lo-fi sound will be an acquired taste to some, but it makes it sound more organic especially on Goddess. It’s always hard producing an album on a shoestring budget (the album was produced by Shea Janne Mackay), so props to Chazz for having the conviction to put this work out and to Shea for the vision and production. Fading Society features distant chiming bells ad haunting synths, which is where the doom element begins to come in on the record. The low-tuning of the guitar increases the sense of dread flowing through the song, while near ten-minute playing time helps too! Penultimate song SKVM creeps up on you and the further you get into the album, the more it grows. It’s not an easy listen but it’s rewarding if you have both the patience and virtue to give it a proper chance. The minimalist structure of SKVM is especially grim (in a good way). The ringing feedback that heralds in the closing duo of Outro/A Tribute To Carlin is as jarring as you’d expect. It turns to be an actual tribute to George Carlin and features a suitably harrowing sample. It ends the same way it begun, but this time with the feedback slowly fading. 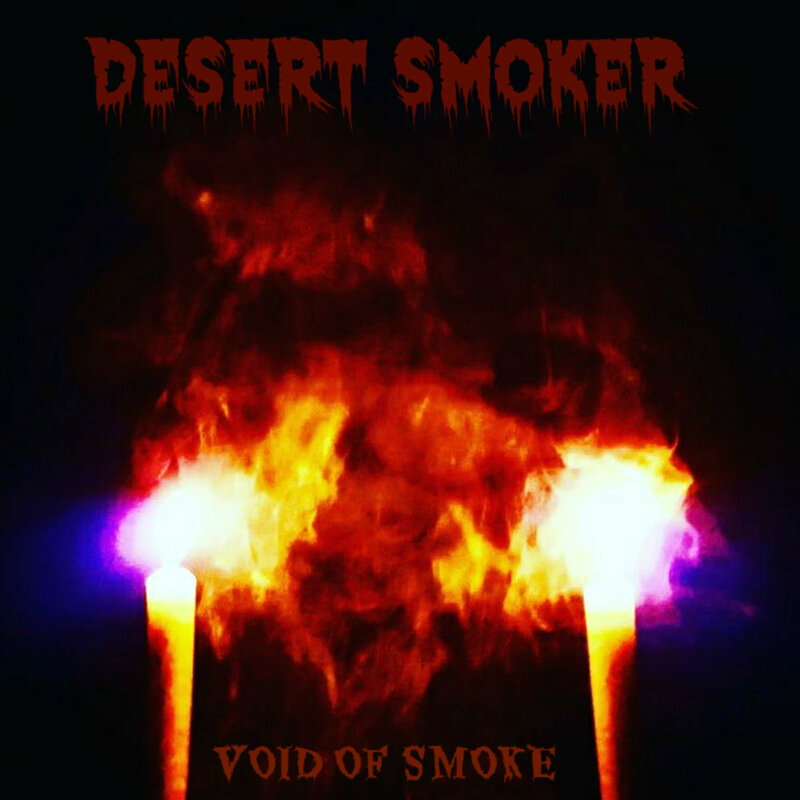 As I said before, “Void Of Smoke” is very much an album for the adventurous, but that’s meant as a compliment to Desert Smoker. Hopefully the band will grow and write more music. It takes time for new bands to mature but Desert Smoker is definitely heading in the right direction. Dude, I produced this album.